When someone we love passes away, it is natural to want to pay tribute to them and find a way to memorialize their life. Though they may not be with you in body, they can live on in your memory. At Phaneuf, we believe that a person’s end of life ceremony should honor them while celebrating the life that they lived. We accomplish this by offering a large product line of keepsake urns and pendants. Why Choose Keepsake Urns and Pendants? There are many different ways to memorialize your loved one. Keepsake urns and pendants allow you to do just that in very beautiful, personal ways. Urns are available in a wide variety of styles and materials. Choose an urn that reflects your loved one’s personality, their favorite interests, or their career. 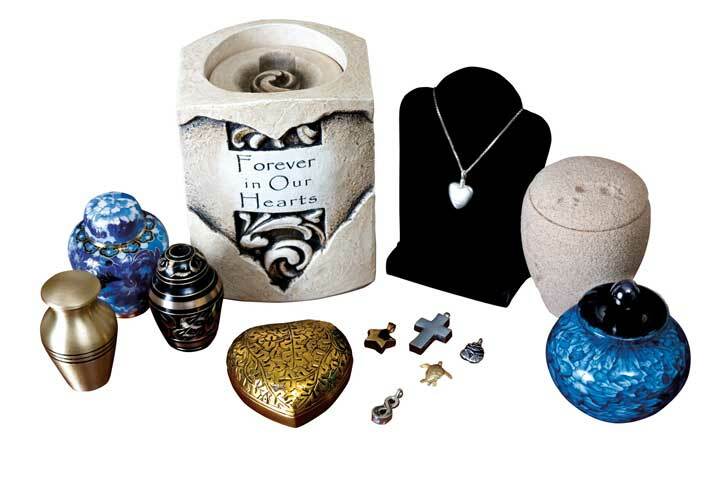 Urn sets allow you to distribute the cremains among several friends and family members, while pendants provide a way to carry your loved one close to your heart. This can all be a very important part of the healing process. You may be separated, but they are never far away. What a beautiful way to remember and celebrate a wonderful life! A cremation urn is a vessel that holds the cremains of your loved one. It is safe and secure, keeping them protected while memorializing the person who has left. These urns are constructed of many different materials, both natural and man-made, ranging from simple to very ornate and intricate. When choosing an urn, think about where you will keep it. Putting in on display in a mausoleum is a lasting tribute, but you will want to carefully consider both the materials it is made from and the style. This also applies if the urn will be on display during the memorial. If it will be displayed in your home, you will want something that is complementary to your décor. It is will be buried, then you need an urn that is made for that purpose. Keepsake urns allow family and friends to retain a small portion of the cremains and create their own memorial of their loved one. There are many small urns that are available specifically for this purpose. While smaller than regular urns, keepsake urns are made of the same materials and many match the styles of the larger urns and are available as sets. Both keepsake urns and pendants provide a way for family and friends to memorialize the deceased in a very loving, personal way. We offer a wide range of keepsake pendants from the Madelyn Collection. Each pendant has a space for keeping a small portion of the cremains, allowing you to keep your loved one close to your heart forever. The pendants come in a variety of styles and themes, from nautical to golf as well as various shapes, including hearts. These beautifully crafted tokens are usually made from silver, gold, pewter, or brass. We also offer Thumbies, beautiful pendants that feature your loved one’s thumbprint. If the decorative urns simply do not suit your purpose or taste, you can always choose our non-decorative urn. It is a simple, plain, black plastic box that will house your loved one’s cremains. It is our no-frills, economical option. Keepsake urns and pendants are a wonderful way to keep your loved one alive in your memory and close to your heart. At Phaneuf, our primary goal is your peace of mind. If you ever want to upgrade your urn, say from a non-decorative urn to a regular or keepsake urn, all you have to do is let us know and we will work with you to help you find exactly what you want.